When the clause is implemented, Member States and EU institutions will be bound to assist one another in the case of a disaster („any situation, which has or may have an adverse impact on people, the environment or property,“ according to the Commission’s proposal) or terrorist attack, as defined in the 2002 Council Framework Decision on combating terrorism. The clause determines that engagement in the territory of another state shall only be allowed at the „request of its political authorities“. Documents produced by the Council working groups dealing with the issue of whether a threshold for the activation of assistance should be laid down in writing show that a dispute has arisen between Member States. The „solidarity clause“ will apply only after all the capacities of the affected country are exhausted. But how is this to be determined? A declaration specifically attached to the Lisbon Treaty states that in cases of assistance the choice of means shall be left to the assisting Member States. During debates held in March, Austria and the Netherlands sought to put in place severe restrictions on the provision of assistance, while Greece and Italy were in favour of a wide scope of application. A European Parliament resolution adopted in November 2012 demanded that the solidarity clause also cover „politically motivated blockades“ as well as „attacks in cyberspace, pandemics, or energy shortages,“  but so far this does not seem to have been taken into account by Member State representatives in the Council: political conflicts have not yet been mentioned. However, „any situation which has or may have an adverse impact on people, the environment or property“ could be interpreted as including uprisings, blockades or sabotage. Member States are also debating the territorial application of the „solidarity clause“: should it be applicable on land, on sea and in the air? Some governments demand that it be extended to ships and airplanes travelling in non-EU regions, while the Commission and consulates have suggested including „offshore oil and gas platforms“. While embassies and consulates are not mentioned, their inclusion can be assumed. 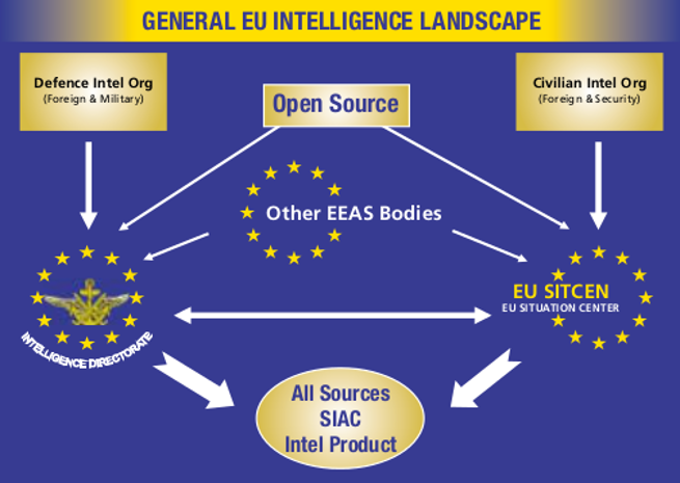 Image: The EU secret service networking (EEAS).